Canadian tangler Rosemary Turpin is back today with her grid-based Spurtle tangle. Spurtle is Rosemary’s fifth tangle on the site, be sure to check out the others! “the historical fiction novel called Cold Mountain by Charles Frazier which is a story about what life was like in the northern states as the Civil War ended. The spurtle is a wooden Scottish kitchen tool, dating from the fifteenth century, that is used to stir porridge, soups, stews and broths. The rod-like shape means that porridge can be stirred without congealing and forming lumps, unlike a spoon that would have a dragging effect during stirring, and the low surface area reduces the chances of porridge sticking to the instrument. Spurtles are made from wood, including beech (in the UK), cherry wood (in the US) and maple (in Canada). They come in a range of sizes. Traditional spurtles have thistles at the top, while modern ones often have a smooth taper.The custom is that a spurtle should be used to stir in a clockwise direction with the right hand. 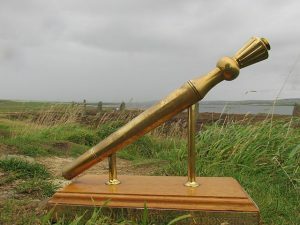 The World Porridge Making Championship awards a “Golden Spurtle” as its main prize. An easy grid-style tangle, Spurtle does require your attention when alternating the areas to be filled in. Rosemary illustrates the step-by-step instructions for drawing Spurtle below and she features it in two ZIAs with second example demonstrating a variation of the original. Thanks for a fun tangle and a reminder of a special trip last year to Scotland where I learned about the Spurtle. Spurtle is a beautiful tangle! Thanks for sharing!! Bob’s Red Mill Quick Cooking Steel Cut Oats won the Golden Spurtle Award in Carrbridge, Scotland, in 2009 AND 2016! My heritage is Scottish and Irish. I was gifted with a spurtle and I often use it when I make porridge! This is a fun pattern. I can see lots of variations with it. Thanks, Rosemary. I actually heard the final results of the ‘World final Porridge’ championships and I believe the winners were from Sweden. Bravo, Rosemary! It is lovely. Hoping to see you soon on a Monday, with your book! Have missed you! The winners of the Golden Spurtle Award for 2017 were, indeed, from Sweden. The contest is held this year on March 31, so we will all await with baited breath the outcome! And, of course, keep tangling “Sprutle”. Rosemary you are quite the tangler! 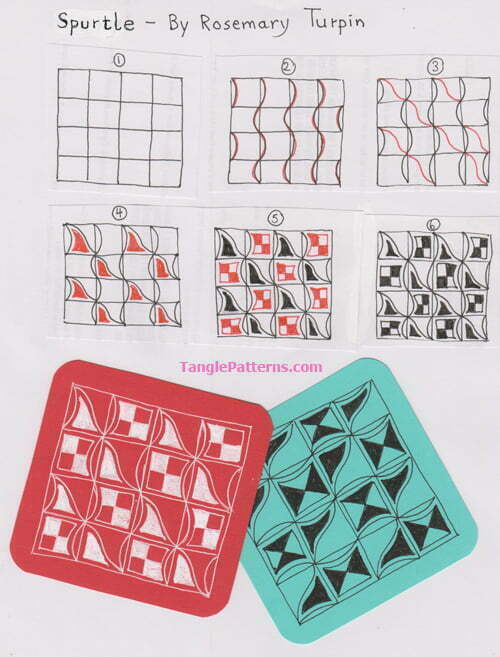 I looked at your other tangle patterns on the website and I love them all. I am naming this day “Rosemary Day” and focusing on your tangles. Very nice. Thank you! And, thank you, Linda, for all you do. I am on your website a couple of time a day and remain completely amazed at all of the work it must take to keep this website up and running in such a current and timely fashion. I cannot tell you how tanglepatterns has changed my life. I have a little desk devoted to tangling with all my supplies organized and a ton of practice paper before I use a precious tile! I am not that good compared to what I see online and I could not come up with a design or pattern of my own but I take joy in the talent of others and their willingness to share with people like me. I draw my tiles and when I am done I hold them up in front of me and I feel good. My goodness, I am overwhelmed by all of your very kind remarks – I have never had so many – you are all inspiring me to try and come up with some more — though of course, I want to see everybody else`s beautiful patterns too! Thank you so much everybody! Nancy, I do think your art teacher was heartless and cruel with his/her remarks. I`m thinking that must have been a few years ago, because most wouldn`t do that now – they now realize how much they can crush a small ego with remarks like that! I`m so glad you are doing Zentangle now and could more than likely “wow” that teacher terrifically with what you do now!